Have you ever made a card, or any paper craft item for that matter, just because. You received inspiration from somewhere, a magazine cover, a gift bag, a bill board, or just your garden, and you had to create something with that 'energy'? Well, that is how this card came about. I didn't need a card for 'anything'; a baby shower, a birthday, a friends parent is ill, a girlfriend needed a pick-me-up, nothing. I saw a page in a home decorators magazine and I got some inspiration, and had to make a card. So, here it is. I really do like it. To keep the look consistent, when I stamped on the crumb cake label, I even stamped off before I stamped on the card stock, so the ink would look 'worn' to match the look of the newsprint DSP. 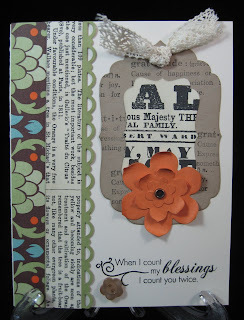 I used mostly Stampin' Up! supplies. 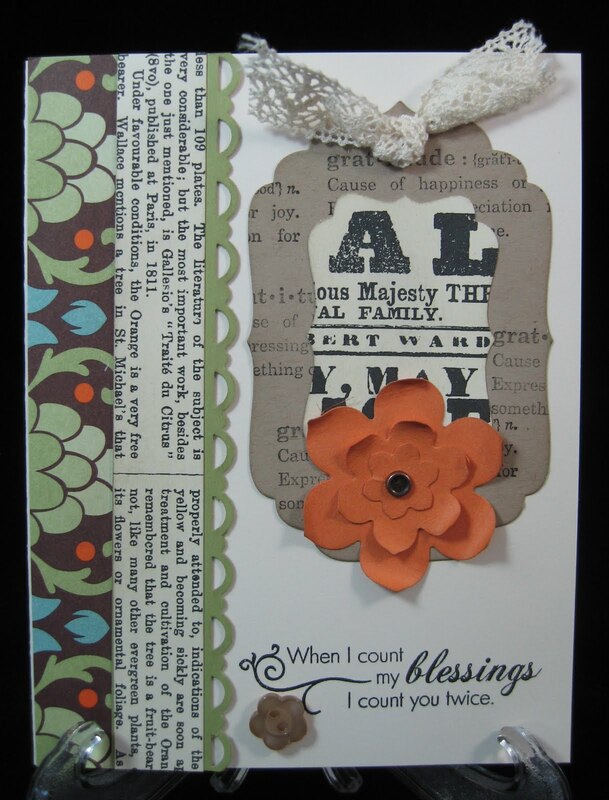 Actually everything I used, except for the sentiment at the bottom, and the larger tag die cut, is SU!. stamp sets: define your life, and fall elegance. paper: very vanilla, garden gala DSP, news print DSP, crumb cake, peach parfait,and pear pizzazz. misc: crochet trim, vintage trickets, fancy label punch, birds & blooms die, and neutral button. Thank you for looking. And let me know what you think. I know its not my typical work, but I really do like it! How about you?